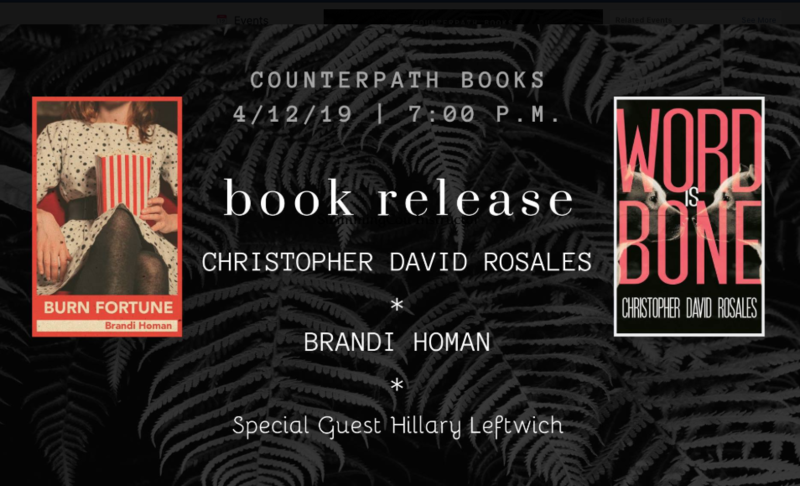 Join us for the release of two new novels, Word Is Bone by Christopher David Rosales (Broken River Books) and Burn Fortune by Brandi Homan (CLASH Books). Featuring special guest Hillary Leftwich, host of At the Inkwell reading series. We’ll have beer and books! We’d love to see you! CHRISTOPHER DAVID ROSALES is from Paramount, CA. His first novel, Silence the Bird, Silence the Keeper, won him the McNamara Creative Arts Grant. His second novel, Gods on the Lam, was published by Perpetual Motion Machine Publishing. His third novel, Word is Bone, is now available from Broken River Books. Rosales currently lives in Denver, where he received his PhD at DU, and is an Assistant Professor at the Jack Kerouac School at Naropa University. Contact him at www.christopherrosales.com. BRANDI HOMAN is the author of the novel BURN FORTUNE (CLASH Books, 2019) and two books of poetry, Hard Reds (2008) and Bobcat Country (2010), from Shearsman Books. She holds a PhD in English, Creative Writing (Fiction), from the University of Denver and an MFA in Poetry from Columbia College Chicago. With her husband and daughter, she lives in the suburbs of Denver, where she thinks about the Midwest and misses drinking Yellow no. 5. Visit www.brandihoman.com. HILLARY LEFTWICH is the poetry and prose editor for Heavy Feather Review and curates At the Inkwell Denver. Currently, she freelances as an editor, writing workshop instructor, guest instructor for Kathy Fish’s Fast Flash Workshop, and writer. Her writing can be found or is forthcoming in print and online in such journals as Entropy, The Missouri Review, The Review Review, Hobart, Smokelong Quarterly, Matter Press, Literary Orphans, Occulum, and others. Her book, Ghosts Are Just Strangers Who Know How to Knock, is forthcoming from Civil Coping Mechanisms in October of 2019.